Blackmith services are at the heart of John Tyre & Sons. We can provide a complete and flexible range of blacksmith services to ensure that our clients get the best quality products and the best value process. 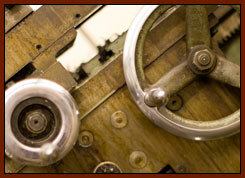 Our skilled workforce are time-served craftsmen who provide the highest quality workmanship. Separate non-ferrous workshop housing TIG welding equipment and large stock of stainless steel and aluminium. Wide range of fasteners stocked for use in fabrication/building and marine industries. We Stock all types of materials required in steel fabrication ensuring that our clients get fast turnaround times on projects. Call Scott to see how we can help you with your fabrication and blacksmiths requirements.